Annie grew up in Tempe, AZ where she spent much of her childhood exploring the great indoors, cruising the concrete suburbs, and swimming in the pristine chlorinated waters of backyard swimming pools. She developed a love for the desert, farming/gardening, and using the outdoors as a classroom while pursuing a degree in Latin American Studies at the University of Arizona in Tucson. With a love for extreme environments, she moved up to Alaska to manage a small and diversified vegetable farm. Annie has a passion for inspiring people to connect with their environment through an appreciation of the plants around them in whatever environment that might be. Annie holds an M.A. in Professional Communication from the University of Alaska Fairbanks. 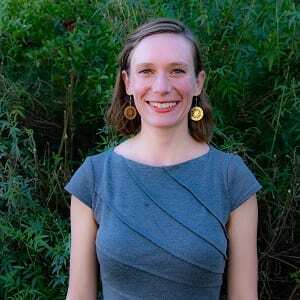 In her spare time, she’ll either be reading, hiking, camping, or teaching landscaping courses in Spanish through the Santa Rosa Junior College.